This Sunday, 11 May, is Mother’s Day in 62 countries around the world. Millions of moms will be given cards, treated to breakfast in bed or taken out for lunch. They will be hugged, kissed, thanked and told how special they are. But for mothers whose children live elsewhere, Mother’s Day is usually the most painful day of the year. More women than most people realise live apart from their children. Even today, when amicable separations occur, mothers who don’t live with their children are regarded as at best an oddity – and at worst, unnatural and selfish. Whatever the reason for separation, living apart from a child can be devastatingly painful. Stress, if they are battling with an ex-partner and trying to help children torn between two worlds. Guilt, tormenting themselves by taking on too much responsibility. Shame if they’ve lost custody – some mothers apart keep their status as a mother a secret to avoid probing questions and possible criticism. Social stigma – it’s still more socially acceptable for men to live apart from their children. Although it might feel like it, know that you’re not alone and it is possible to live a full and happy life and be a loving mother, living apart from your child. Don’t allow guilt to get in the way of your relationship with your child, a new partner or indeed having another child. Let go of trying to be a superwoman. Maintain as much contact with your child as possible, perhaps through a third party. If you have contact, listen well to your children and be as honest as possible – this is the way to build trust and increase your chances of a good relationship in the long term. Find the support you need. Create an understanding support team around you – your friends, family and, should you need one, a counsellor who understands the loss experienced by women separated from their children (see www.amotherapart.com). 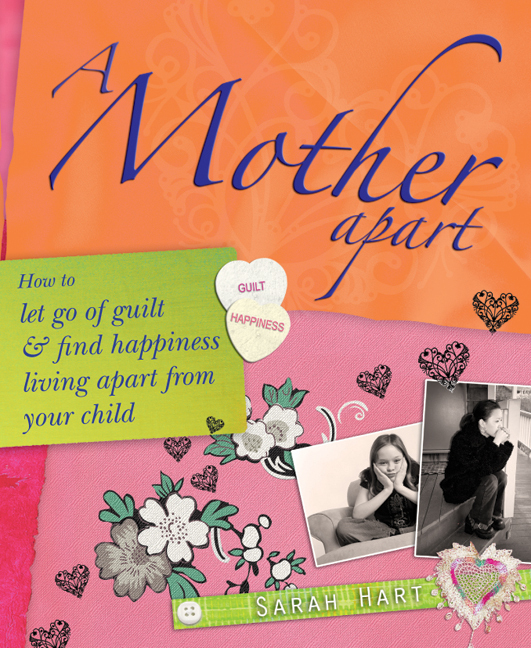 Read and do the exercises in my book, ‘A Mother Apart: How to let go of guilt and find happiness living apart from your child’. · Remember, you are and always will be your child’s mother 365 days a year, no matter what has happen in the past, or what might happen in the future. · Remind yourself that giving birth to a child is a huge achievement. Sit quietly for a while and honour your status as a mother. · Buy yourself some flowers. Plan a special treat or, better still, ask your partner or a friend to take you out for a springtime walk, a health spa day, a delicious meal or whatever you love doing best! · Keep your heart and your door open, you never know what’s around the corner. Today is International Parental Alienation Awareness Day. Parental Alienation happens when a resident parent tries to manipulate a child into saying that they don’t want to have a relationship with their non resident parent. The term Parental Alienation Syndrome (PAS) was coined by Dr Richard Gardner who described it as a disorder that happens solely in child-custody disputes in which a campaign of denigration is initiated by a resident parent, managing to turn the child against the non resident parent, resulting in the child’s apparent desire to end all contact with the parent they no longer live with. (Just to be clear, Parental Alienation doesn’t of course occur in cases were a parent abuses or neglects a child). Parents who discover that a once loving relationship with their child has changed, often quite suddenly into the complete opposite, understandably suffer acute pain and despair. Their stories of rejection, character deformation and sometimes false allegations are heartbreaking. Two such courageous women share their experience of Parental Alienation in my book ‘A Mother Apart’. Their strength, tenacity and absolute commitment to remain in their children’s lives, is an inspiration. Sadly, mothers and fathers who suffer as a result of severe parental alienation are usually faced with the long haul, sometimes waiting until children have grown into adults before any form of reconciliation can take place. Sometimes becoming a parent themselves makes an adult child want to reconnect with and find out more about an alienated parent, and to ask questions about their past. However, we never know what’s around the corner so if you’re an alienated parent, try to keep your heart and door open, as circumstances can change at any time. Maintain as much contact as possible with your child. Find ways to stay in touch and let your child know that you love and miss them, without saying how upset you are. Say that you look forward to the day when you can spend some time together. Sounds tricky in a highly emotional situation such as this, but finding good emotional support for yourself is essential to helping you contain feelings that might overwhelm your child. Be as imaginative as you can in coming up with ways to stay in touch. Phone, text, instant message, send e-cards, snail mail letters, cards, postcards. Try and find out what her/his latest interest is and send collectables, magazines and cut out articles. Send photos of you, your family, pets and friends she/he will remember. Remind her/him of good times in the past and tell them about what is happening in your present. Maybe your attempts will reach your child, maybe they won’t but if they do, they’ll let your child know that you love and care for them. Don’t give up. Without a doubt, staying in contact, even if it feels like your efforts are going into a void, is the best way of increasing your chances of reconciliation in the future. Keep your focus on yourself, not you ex. You are never going to be able to change your ex, so don’t waste your energy trying to convince him that he is out of order or treating the children unfairly by denying them contact with you. Don’t hand your power over to your ex. Try not to allow any fear you feel to influence your behaviour. Keeping yourself small or trying to keep him sweet won’t help. Instead of allowing yourself to feel intimidated, set clear boundaries, calmly and assertively. Develop these skills within yourself by having counselling or doing a course if you need to. When we choose how we behave instead of reacting to someone else’s behaviour, we feel more in control. Think dignity and act calmly. You will feel better for it, your ex will lose his power over you and your child will see you role modelling dignified, adult behaviour. Take outrageously good care of yourself today. Go well.